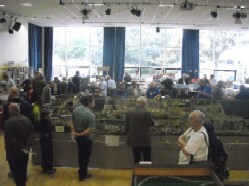 The North American section's main layout, Schaffons Crossing, is built in 3.5mm/HO scale. The layout is 25 feet x 7 feet and, like most of our previous layouts is designed with two main aims uppermost in mind: to run long passenger and freight trains in the American style, and to run plenty of them - continuously! The main line is a folded figure-of-eight, and allows us to run several trains in each direction, and the overhead circuit, shuttle and logging section all provide additional running. Always movement on this layout! 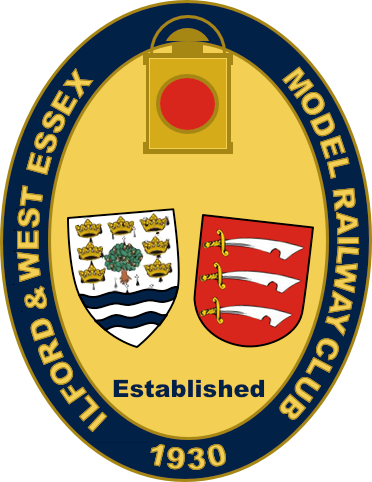 The layout is not modelled on any particular region or era, giving scope for a wide variety of stock to be used, and the members between them have an extensive and varied collection of HO gauge rolling stock.